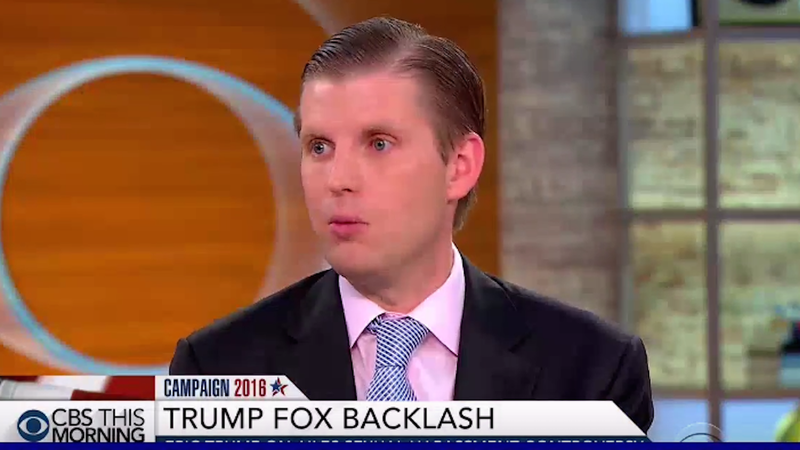 Eric Trump, a sobering reminder of gnarled orange trees and ferret-faced little apples, appeared on CBS News on Tuesday morning to defend his father for viciously feuding with the family of a dead soldier. He also found time to underhandedly blame women for getting themselves sexually harassed at work. Whatever else you do today, gang, at least you didn’t do those things. Trump the Younger insisted to CBS This Morning during a painful, protracted back-and-forth that his father isn’t “anti-Muslim” just “anti-terror.” Then he moved on, indirectly, to the subject of Roger Ailes and sexual harassment. Trump the Elder, as you might recall, said that if Ivanka were sexually harassed at work, he would advise her to quit her job. Eric defended his dad’s comments, as is his wont, before adding, furthermore, that bad things don’t happen to nice girls. Can’t wait for this dignified, non-sociopathic group of people to pull up a moving van in front of the White House!